In the opinion of many Quebecers, the so-called "Quiet Revolution" associated with various reforms implemented by the provincial government in the 1960s is viewed as progress and as the advent of a system of thought liberated from religious enslavement. In short, as access to modernity. We submit an alternative interpretation. 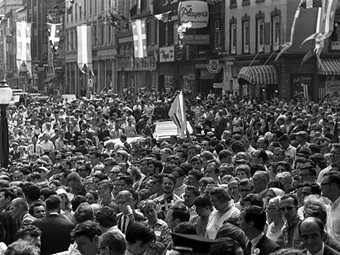 It can be argued that Quebec society in the 1960s freed itself from a certain fundamentalist religious enslavement. On the other hand, it became enslaved by an ideology as powerful as (if not more so) the belief that characterized its traditional faith. This enslavement is called statism or state control. Such ideological evolution is not exclusive to Quebec, of course. Canada as a whole has moved to a system of welfare entitlements from cradle to grave. Relative to the US, it has become more unionized; more protected from foreign competition; its businesses are more subsidized; and Canada is more heavily taxed (38.4% of GDP as opposed to 32.0% in the US in 2011). (1) The result is the loss of a chunk of individual liberty. The movement toward a more public system has simply been more pronounced in Quebec than in the rest of the country and of North America in general. In fact, Quebec has copied the European model. In 2009, Quebec’s share had reached 47.3% versus 38.4% in Canada as a whole, almost 9 percentage points higher. (3) Quebec's civil service employs the same number of people as California’s. (4) It should be noted that the separatist movement is itself a side product of this faith in the power of the state to do good. Separatism, which developed in the 1960s, is an aspiration mostly promoted by leftist intellectuals who associate progress and modernity with state planning. How to interpret this evolution is a difficult question, but drawing on the economic theory of information in an economy where two languages are spoken, it can be shown that the Canadian labour market was, and still is, segmented by the cost of information. The small-economy position of the French-speaking segment leads to nationalism for some and to a search for greater integration for others. (5) A more radical interpretation of this evolution views the phenomenon as derived from its non-British origin;(6) a Fraser Institute study ranks the ten most free economies as British-derived,(7) with the exceptions of Switzerland and Estonia. I also take it for granted that in the history of mankind, freedom has been the exception. Prior to the Industrial Revolution, the average human lived on between one and three dollars a day. But from that point on, for the first time in human history, per capita income in a few European countries and particularly in the USA began to grow rapidly. This was the result of economic freedom, which enables entrepreneurs and small businesses to flourish. The free-market system proved to be the greatest engine for prosperity and opportunity. Doubt about the effectiveness of policy is of course rejected by advocates of state planning. At the same time, this belief in government is far from the demonic perception of the free market by "warmists," who often claim that endorsement of free-market economics implies rejection of climate science. As far as the distribution of income is concerned, the political left in Quebec (and to a lesser extent elsewhere) counts on the hand of government to move people up the economic ladder. In fact, this never works, despite its good intentions. Conservatives and libertarians by contrast understand from experience that the only way to help people climb the economic ladder is to provide them the opportunity to pull themselves up one rung at a time. Studies consistently confirm that countries with higher levels of mobility and economic freedom have poverty levels as much as 75 percent lower than countries that are less free. Quebec and continental Europe show that more government is not the way to do this. Both have had higher levels of public spending than the United States, and both have had lower GDPs per capita. As usually follows from a well-established rule, the consequences of public budget inflation proved to be disastrous. Figure 1 shows changes in Quebec’s share of the total Canadian population since 1921. It can be seen that this share remained constant at 29% from 1941 to 1966, but showed a declining tendency thereafter, to stand at 23.1% in 2011. In 1981, the population of Quebec was 74% that of Ontario, vs. 61% in 2011. Similarly, the population of metropolitan Montreal represented 94% of Toronto’s in 1981 vs. 68% in 2011. Should the trend continue for the next half century, Quebec would have a population of approximately the relative size of British Colombia today. Source: www.stat.gouv.qc.ca, January 13, 2012. When measured in terms of overall economic growth, investment and employment increase, the Quebec economy has witnessed a widening gap with Ontario and the rest of Canada over the past decades. Considering the period from 1981 to 2004, as studied by Boyer,(8) the following picture emerges. Real GDP growth averaged 2.4% in Quebec versus 3.0% in the rest of Canada, for an overall gain of 70.9% in Quebec and 96.3% in the rest of Canada. The Quebec share of national GDP declined by 2.4 percentage points to 21.0% during the same period. From 1971 to 2004, Quebec’s working age (15 to 64) population rose by 33.9%, compared to 70.9% in the rest of Canada. Over a shorter period from 1981 to 2004, employment gained 43.9% in the rest of Canada (38.7% in the U.S.), but only 32.8% in Quebec. Also for the period 1981-2004, with 23.6% of the population in 2004, Quebec created only 19.7% of the new jobs available in Canada. While only 56.2% of the Quebec population aged 15 and above was employed, the corresponding figures were 61.2% in the rest of Canada and 61.9% in the U.S. Observers often assume that overall GDP and per capita income move in the same direction at regional levels as they do at the national level. We argue below that interregional adjustments within a national, integrated economy are realized, not through price or per capita income differentials, but through people’s mobility. Quantities, not prices, adjust, because prices are determined by outside forces. Slowly-growing regions should therefore have as high per capita real income as fast-growing ones, even though they grow at a lower rate. In Canada, a federal budget indicates that “even though economic disparities between provinces are still substantial, they have nevertheless declined significantly over the past 25 years.”(12) This reduced dispersion occurred as important movements of the Canadian population took place: declining shares in the Atlantic Provinces and Quebec together with rising shares in Ontario, Alberta and British Columbia. As shown above, the Quebec share of the Canadian population remained around 29% between 1941 and 1966, but after that period, it showed a constant negative trend to reach 23.1% in 2011. Overall, our data confirms that economic integration through trade, labour market adjustments and migration lead to real personal income equalization, not to price or income differentials. In Quebec, a form of consensus on the state of the economy is by now entrenched. In this view, not only is the province not losing ground, it has improved its position relative to the rest of Canada and to Ontario in the past few decades. (13) Because GDP per capita in Quebec has moved up nearer the level for Ontario since the end of WWII, this result is interpreted as proof that rising intervention by the Quebec government since the so-called "Quiet Revolution" is behind the narrowing gap. What this actually shows is that the indifference principle applies across regions and that interregional adjustments are realised not by per capita income but by migrations. In terms of nominal GDP per capita, personal disposable income and average weekly earnings, Quebec lags behind Ontario by 10% to 16%, but those figures are not adjusted for differences in the cost of living since no such provincial index is available. By the Consumer Price Index for October 2006, the cost of living based on a basket of all goods and services in Montreal was 14.7% below Toronto, while the housing cost stood at 30 to 35% below Toronto. For its part, Human Resources and Social Development Canada (2007: 78) in 2004 set the cost of an identical basket of goods and services at 19.2% below its counterpart in Toronto. Housing costs alone explained 90% of the gap, estimated at $5,796 per year. Montrealers in general earn lower monetary incomes, but these are wholly offset by lower land and local service prices. When extended to the whole of Ontario and Quebec, this suggests that the lower cost of land in Quebec almost perfectly compensates for the lower GDP per capita. The divergence in total growth has been capitalized in land prices. What does not equalize across the economy is the price of the fixed resource, land and physical structures. Quebec’s per capita income has matched real income in Ontario in spite of its dismal growth and therefore in spite of the “Quiet Revolution,” not because of it. As a result of longstanding trade, the economies of the two provinces are closely integrated. Labour market mobility and how immigrants choose their location have resulted in real income levels being equalized across the two provinces, despite the widening gap in total GDP. We emphasize that these results are empirically validated in the US, the UK, and France. Quebec is a lagging province to the extent that its share of the Canadian population, of GDP and of the labour force has declined since the Quiet Revolution. The population’s movement and its corresponding change in GDP indicate that in a provincial economy, integrated into a national economy, adjustments are realized by quantities, not prices or income per capita, except for the price of land and local services. Because land is a resource in fixed supply, its price increases faster in Ontario than in Quebec. The adjustment process continues until real income per capita has equalized across the two provinces. The wide divergence in total growth between Ontario and Quebec has been entirely capitalized in the price of land and local services. Thanks to people's mobility and lower growth of the Quebec population, Quebec residents have participated in the rise in the Canadian standard of living. This result entails a drawback however: To the extent that less mobile Quebecers have not suffered from lower per capita income, they are less likely to resist state control. 1. I have in mind here the traditional United States, which has been the world leader in the promotion of democracy and free markets. Its recent evolution raises doubts on its example as the best practitioner of these virtues. 2. Statistics Canada, Provincial Economic Accounts 1961-1976 and Provincial Economic Accounts 1963-1978, Ottawa, Ministère des Approvisionnements et Services Canada, 1978 and 1981. A more extensive study of Quebec economic history is available in Vincent Geloso, Du Grand Rattrapage au Déclin Tranquille, Les Éditions Accent Grave, 2013. 3. K Treff and D. Ort, Finances of the Nation 2011, Table B.8, p. B-14, Canadian Tax Foundation 2012. 4. Mark Steyn, "Is Canada's Economy a Model for America?" Imprimis, January 2008, Vol. 37, No. 1. 5. The idea that scale economies of information are important in labour markets was first suggested by Kenneth Arrow and presented as a problem of external economies. Condensed in Jean-Luc Migué, "Economics and the Problems of Minorities," in L.H. Officer and L.B. Smith (ed.) Issues in Canadian Economics, McGraw Hill Ryerson Ltd., 1974, pp. 258-274. 6. Mark Steyn, Op. cit. 7. Fraser Institute, Economic Freedom of the World, Annual Report 2007. 8. Boyer, M. (2006) La performance économique du Québec : constats et défis II, Montreal: Centre interuniversitaire de recherche en analyse des organisations. 9. Mitchener, K.J. and I.W. McLean (1999) "U.S. Regional Growth and Convergence, 1880-1980," The Journal of Economic History, No. 59, pp. 1016-1042. 10. D.B. Smith, Living with Leviathan, Hobart Paper 158, Institute of Economic Affairs, London, 2006. 11. M. Fesseau, V. Passeron et M. Vérone, “Les prix sont plus élevés en Île-de-France qu’en province,” INSEE Première, No 1210, October 2008. 12. Department of Finance (2006) Budget 2006. Restoring Fiscal Balance in Canada: Focusing on Priorities, Ottawa, May 2, p. 115. 13. Fortin, Pierre (2001) “ Has Quebec’s Standard of Living Been Catching Up?” in P. Grady and A. Sharpe (ed. ), The State of Economics in Canada, Montreal: McGill-Queen’s University Press, pp. 381-402.